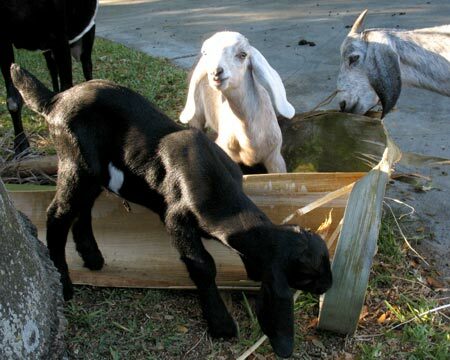 The baby goats and their mothers nibble on a royal palm frond. Goats are browsers and will eat all kinds of vegetation. Hani Khouri makes ice cream and several varieties of cheese using milk from his own herd of Nubian goats. He keeps them on his farm in Redland. It’s always fun to visit and take pictures of cute and friendly goats. They, in turn, like to nibble on my shirt and fingers if I’m not paying attention. 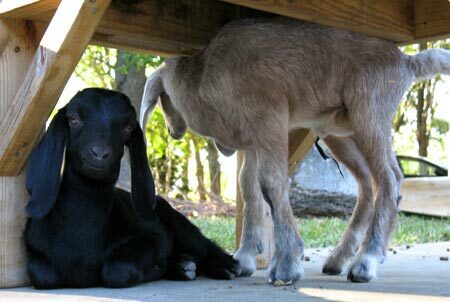 The new kids on the farm hanging out underneath the milking stand. The white one still has his umbilical cord. They are about a week old in this picture. Back in March, Hani’s herd grew to 17 with the arrival of two new kids. They’re both male, which is a problem, because two grown bucks are already in the herd. Hani prefers to keep only one buck with his female goats. 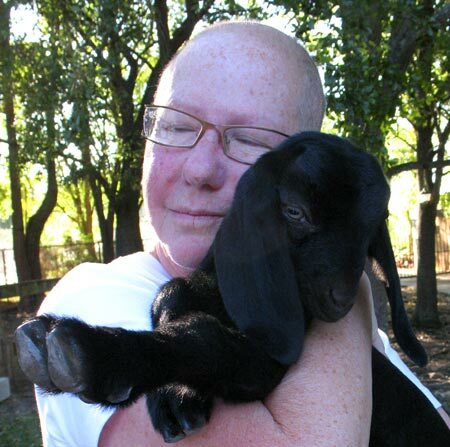 Marylee Khouri holds one of the new kids. When I went to see the kids, they were only a few weeks old and in that awwww how cuuuute stage. Now they are four months old, bigger but still cute, and Hani is looking to sell them — but only to the right buyer. “Not to eat, and no santeria!” he said. He’d like to see them go to a herd where they can grow up and live out their lives. If you are interested please contact Hani at www.hanisorganics.com If you are located in Miami-Dade or Broward counties and are interested in purchasing goat cheese, goat milk ice cream, or Mediterranean food, you may do so through his web site.